Dhoom3 first motion poster is here. More expectations been created on this movie, Dhoom3. Yash Raj Films finally released the most expected motion poster of Dhoom3. The motion poster holds the Aamir Khan and Katrina Kaif along with other lead role players Abhishek Bachchan and Udhay Chopra. Everyone looks hot as they are on fire. Look at the poster below. The first teaser trailer of Dhoom3 have already made a record in first week and the most expected motion poster has been revealed today. Four of them in the poster are attracting in black. Aamir Khan’s built arms is viewed in his sleeveless and Katrina looks spicy in her costume. Jai Dixit(Abhishek Bachchan) and Ali(Udhay Chopra) too honor the poster with their great looks and going to perform some expected and thrilling chase in the movie. Look at the video above which shows the great bike stunts. Another time, by this video, the flying bike stunts marks the presence of great bike stunts in the movie. Every step of the movie make the fans to be inspired. Everyone is eagerly waiting for the movie on the screens which is going to happen by this December 20. Finally this year is going to end up with a Dhoom. We are going to watch the daredevil stunts of Katrina too in this movie. 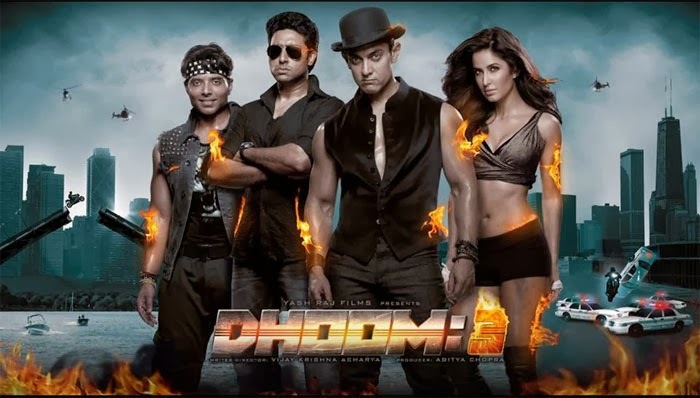 Readers look at the motion poster of Dhoom3 and share your views on it and are you waiting for Dhoom3?